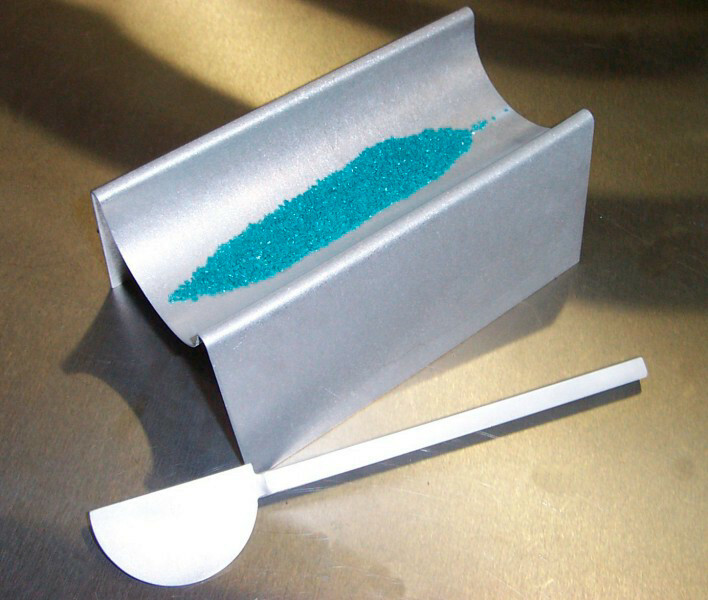 The Handi-tray is perfect for powdered glass and frit. For those of you who are not familiar with this - the powder is poured into the tray and the glass object is rolled into the frit or powder inside the tray. The curved shape allows for even application to any project, and also easy clean up. A matching paddle is used for moving the frit or powder inside the tray. All five products are made from 1/4" thick aluminium making them a sturdy and long lasting product. The Handi-trays are available in various sizes, a Mini model, a Small 6" model and a Large 10" model. The handle on the Regular Paddle is approximately 10" long, while the handle on the Mini Paddle is approximately 5" long. All items sold separately. For more information on this product view its catalog page now , or for more information on our many other products and services get our complete catalog from our downloads page.